Union Square is the big kahuna of shopping for San Francisco. This is where you will find all the big name brands and luxury shops. 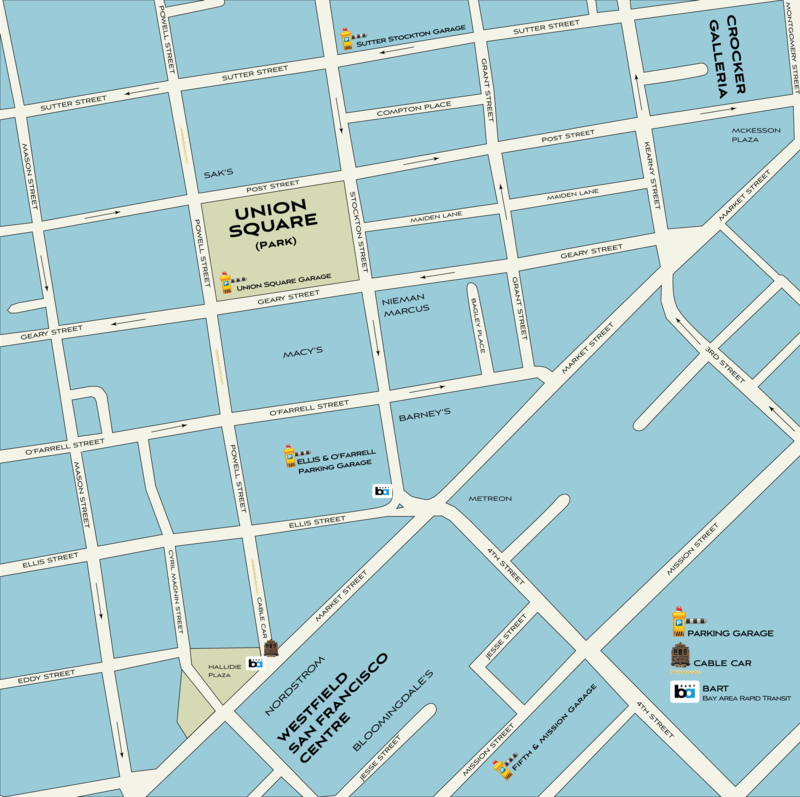 Union square is made up of blocks of buildings housing all these great stores as well as two enclosed shopping areas. One is a semi-enclosed group of shops and borders on the Financial District called the Crocker Galleria and the biggest jewel of a shopping center is Westfield's San Francisco Centre which contains Nordstrom and Bloomingdales. In the middle of everything is Union Square guarded by some of the larger department stores such as Macy's, Neiman Marcus, Saks and Barneys. Union Square itself as outlined by the big green rectangle on this map is a beautiful area to hang out, take a rest between shopping, buy 1/2 price tickets for the theatre or other events and most of all enjoy a coffee or some lunch at the outdoor café - Emporio Rulli. We love Red Maps. They are durable, packed full of information and easy to read. Along with shopping information, you will find information on attractions such as museums, parks, churches, libraries, galleries, theatre, and restaurants, along with an easy to use map of San Francisco’s BART metro system. You can purchase this map for San Francisco at RedMaps.com.